We all have our traditions: visiting the family on a major holiday, going to the midnight mass on Christmas Eve/Day, having eggs for breakfast on Saturday morning, etc. They can be something to look forward to, or something to dread, and you put it in your mental calendar regardless of the effect. One of my own traditions was something started on my 21st birthday, when I had dinner with my family at a little (yet quite popular given the size of the place) restaurant known as Maria Pia's. I never intended it to become a tradition - I just wanted to eat at an Italian place for dinner on my birthday - but the staff and food made such a good impression on us that when my next birthday came around, I thought, Yeah what the hell let's go there again. So we did, and again the next yet, and... you can see where this is going. I even took my friends to that place one year, and another time I had a friend take me as a belated birthday present. Another unintentional tradition that started around my 21st was that a friend of mine, the same friend who took me to Maria Pia's, and the one who I've often referred to as 'hug nazi' throughout this blog, would always be out of the country on my birthday. She does love to travel, and I never really thought much of it until I started noticing that it always happened around my birthday: OE, someone's wedding, a job, whatever the excuse, something would take her out of the country or she would make sure she was out of the country. When she started to realize the pattern herself, she actually started to feel guilty, and it was that guilt that had her take me to Maria Pia's as a belated birthday present for after she got back from her latest overseas adventure. With my birthday now within my range of foresight (which doesn't really look that far ahead), it's looking like 2011 will be the end of both of these traditions. For the last year, hug nazi was overseas for work (the cause of her missing last year's birthday) and has recently returned, with no plans to go away for the foreseeable future. I brought this up in a Skype call between us a few months back, and while she was happy to be around for my birthday for the first time in... forever, I was feeling a bit odd about it, simply because it felt like we were breaking tradition. I even considered taking myself out of the country for my birthday, just so we'd be in different timezones so technically it would still count, but I'm already booked to be here because I've got tickets to the Rugby World Cup around then. And earlier in the week I found out that Maria Pia's has closed. I went so far as to tweet that "...a part of me has just died", and then went to the site of Maria Pia's earlier today just to see what happened to it. Sure enough there were signs saying that it was gone and a new restaurant would be opening in it's place. I brought this up with my guitar buddy over dinner a few nights ago, and she and some others at the table suggested that I could invent my own Maria Pia's atmosphere come this year's birthday (and kick hug nazi out :P ), or simply start some new traditions. 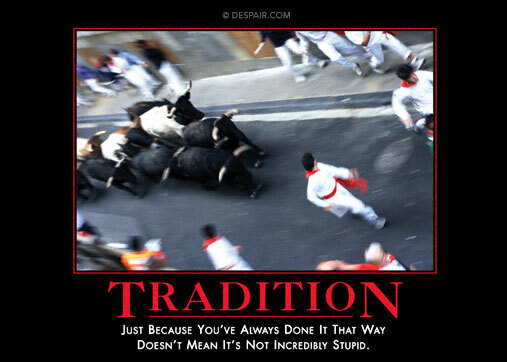 New traditions. Starting something new. Both exciting and slightly frightening prospects. Repetition makes us good at things, makes things easier, and tradition is really just repetition with a predictable time period - it's easy, you know what's going to happen, when it's going to happen, you have some idea of what to expect, and it's safe. I'll admit: I'm pretty risk-averse - years of getting figuratively stabbed in the face after putting yourself out there will do that to you - so to have these 2 things suddenly vanish has made me a little uneasy. I tried listing the number of other traditions or little rituals I have, and either my memory is really crappy right now, or I only need the one hand to count them on. After all this time of trying to be the one my friends could rely on, to be the rock to help others through their own transitions, it turns out I have very little to rely on myself. Is that irony? Or is that just some kind of imbalance that I need to sort out? Either way, I predict I'm going to have one of those thinking moments in my immediate future.